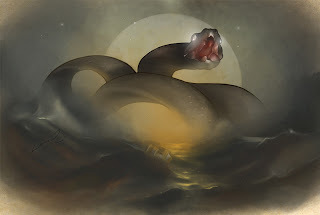 Of Amerindian origin, the legend of the Great Snake or also called Boiúna, Cobra Norato or Great Mother speaks of a huge snake of enormous size, which inhabit the deep part of the rivers and lakes and has bright eyes and body and can take other form to fool the Indian. The legend is well known among riverine populations of the Amazon which states that when crawling the land, the ridges that snake leaves turn in streams and rivers. This is a this is genuinely a myth from Pará. Our legend says that one woman of name Zelina gave birth to a couple of twins: Honorato and Maria Caninana, two snakes. She threw them in the river, where they created, but Maria Caninana keep doing wrong thing until she was killed by his brother, who had a good heart.